Rabbi Yehuda the Hassid ("the Pious"), who lived in the 12th Century, warned Jews who rode horses — the only means of transportation then — against using spurs because they were cruel to animals. Spurs were found in Etruscan tombs as far back as the 2nd Century BC. They were made of bronze with a simple prong; spurs with rowels were a later European development. 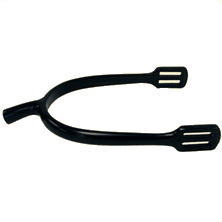 A spur is a U-shaped metal device strapped on over the boot, above the heel, facing backwards. It is used with the intention of driving a horse forward or to make the horse go faster. 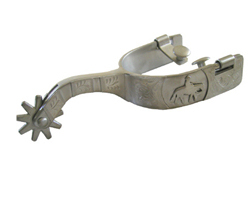 Spurs are commonly used by riders in most disciplines, including those where horses are exploited for entertainment, personal or public, like barrel racing and rodeo events. How do spurs really work? Muscles and nerves cross a horse’s flanks (sides) in a diagonal direction, with a particularly sensitive spot at the point of the crossing. Once a rider is mounted his lower legs will pass over this area. Even slight pressure from the lower leg in this area causes an involuntary response in which the horse will bring his hind legs under himself and instinctively move forward. When a rider wears spurs, he is pressing or kicking the horse in this sensitive region. Watch any horse outdoors, simply standing or freely grazing, and take note of what you see when a fly lands anywhere on his skin. His skin will vibrate and react even to the lightest touch. He might instantly flick his tail. He might reach back with his head to chase the fly off. Alternatively, place your hand lightly and gently on his side, and he will move aside in the same way you react or influence a partner when you are dancing together. Horses are extraordinarily sensitive. Is the use of a spur cruel? Yes. 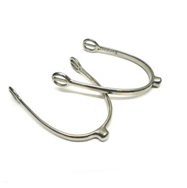 The spurs popular among Western-style riding are the most severe and can cause bleeding wounds as well as sharp pain in the course of a riding event. Riders often will kick their horses sharply to make them move faster or turn more quickly. This is apparent in rodeo events like barrel racing or roping. The nature of the movement makes the rider’s legs unsteady and flail, kicking the sides of the horse. In Eastern-style riding, the use of spurs is usually characterized as being for more precise rider control. However, most riders in those various disciplines really are using spurs to get their horses moving or going faster. Many riders will defend the use of spurs and say that they can be used subtly and lightly; they say that horses are used to it, and they argue that it is only a part of training. In fact, whether advanced or amateur, riders substitute the rigors of good horse training and rider experience with powerful spurs. 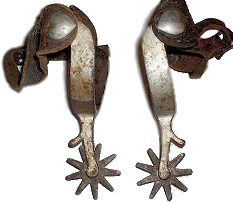 Teachers of riders, as well as trainers of horses, frequently encourage the use of spurs and use spurs themselves — their use is ubiquitous. It is only the exceptional equestrian that has such control and balance that his lower leg (and foot) will be totally still to the point of not pressing so hard against the horse’s flanks that it inflicts pain. 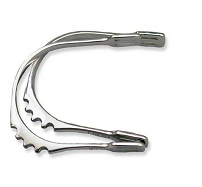 Most riders, even though they use spurs, are very aware of the pain and problems inflicted on horses by using spurs. Many variations of spurs have reached the market redesigned in ways to limit wounds but still be able to function to some degree. Limiting one’s choices to a less aggressive design can make a significant difference. What kinds of wounds are caused by spurs? 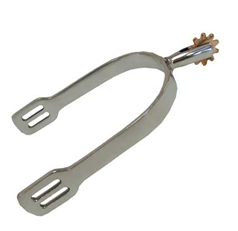 It is clear that riders, and certainly student riders, should avoid using spurs. However, as part of raising the consciousness of young people who do ride, it is important to understand that they have been exposed to using spurs as a common occurrence, and they have seen this use by those they look up to and want to emulate. Bringing up this issue challenges their loyalty to their riding mentor as well as to what they have learned to be acceptable.